Mei Ohara is an electric violinist, singer, and electronic composer who claims to be a Neptunian visitor on planet Earth. Though she spent most of her life studying and performing classical music, electronic and experimental music, as well as multiple video game soundtracks won over her alien heart. 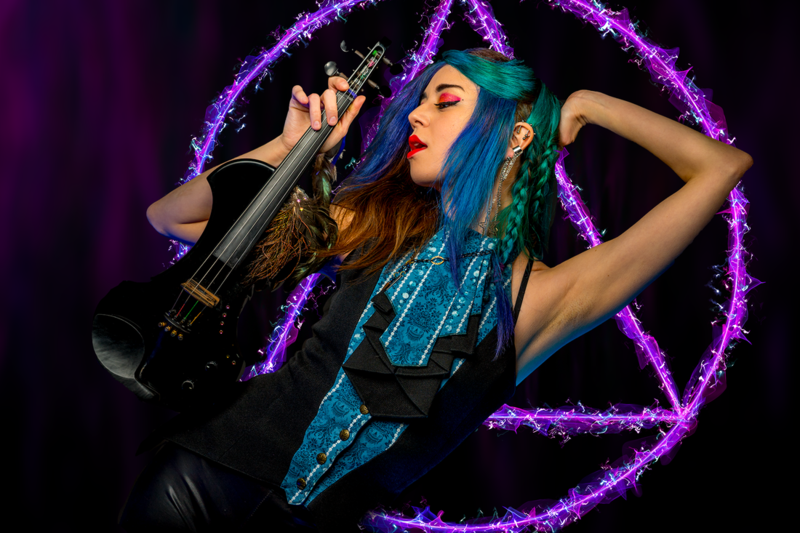 She continues to use her classical background and intensive violin training in marriage with distortion, futuristic beats, and spacey soundscapes. She also draws a large amount of her inspiration from astronomy, sci fi, and the comparison of structured science versus fluid art. The emphasis on supposed opposites combining in unity is further evidenced by her binary hair and mixed blood as a half-Japanese, half American. On her latest release, "Cold Blue Sphere," the songs explore the journey of trying to understand and be a part of human life and the things that are complex, often impractical, yet thoroughly valued, such as companionship and love. As the album progresses, the collective protagonists experience waves of inclusion and isolation, until the difference between reality and illusion is unclear.